Enjoy this collection of black whippet pictures and find among these black dog names the perfect one for your whippet pup. 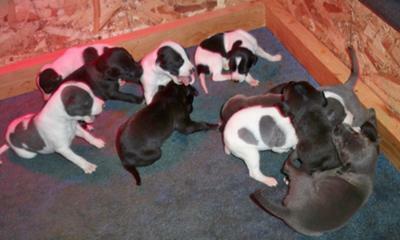 Black whippets don't seem to be as popular as the flashy brindles and particolored. Maybe they don't catch the judge's eye in the show ring like colored dogs but, nevertheless, black and blue whippets also became great champions like Ch. Poaching Black Jack, Ch. Martinsell Grand Slam, Ch. Nimrodel Noir, Ch.Nimrodel Zenith and Ch. Laurelcote Lady in Black to name a few. There is no doubt that although black and blue are considered "difficult" colors, they can be very elegant indeed. 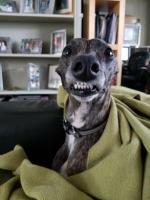 Here is a collection of whippet pictures from our visitors, completely dedicated to the black and blue dogs. The color of the skin and hair is given by two pigments the eumelanin (black) and the pheomelanin for (brown/red). The absence of these pigments results in white hair and skin, therefore white is not a real color but more a lack of it. 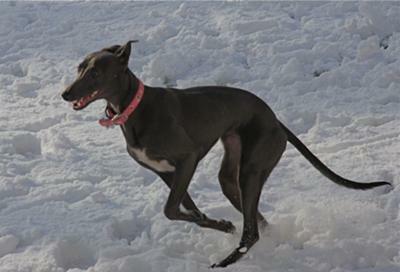 Part of the charm of the whippet dog breed is the infinite variety of coat colors and patterns that make every dog so special and unique. This huge variety is the result of the interaction of the genes that determine the distribution, the combination and the amount of the pigments on the hair and skin. Not many kennels breed for a specific color so, it is always a surprise to see all the different coat colors in the same litter of puppies. 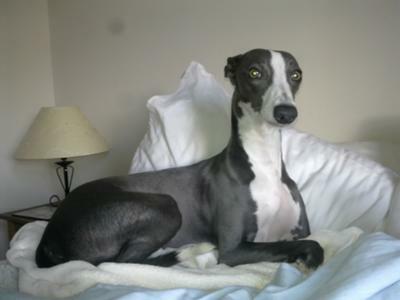 The UK whippet standard states that the eyes should be "oval, bright, expression very alert" but doesn't require any specific eye color while the American whippet standard specifically requires "eyes to be dark brown to nearly black in color". Whippets with diluted colors, especially the blue, can show blue eyes as puppies and, once adult, they often have less intense eye color than darker whippets. 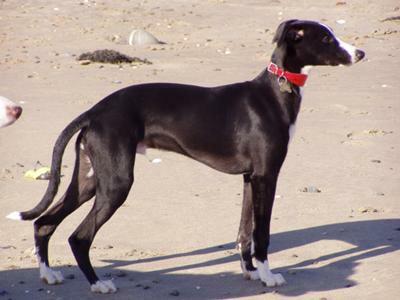 A beautiful black whippet deserves an elegant name, click on the link to find the best black dog names. Do you Have a Back Whippet? 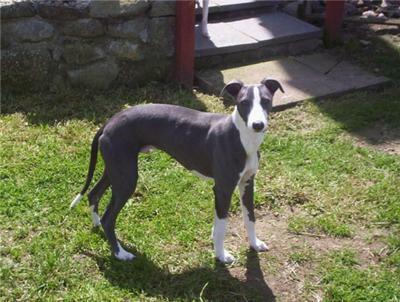 Do you have a blue or black whippet? Share your pictures and stories!